Earlier this year, I (together with Ms Turquoise & Roses and Mr BiG) was invited to be part of the initial jury for the Miele Guide, an exciting, new and truly unique Asia-regional restaurant guide. Yesterday saw the culmination of a long and rigorous voting and selection process with the official red carpet launching of the Miele Guide at the Grand Hyatt Singapore. Taking the top honours this year is Iggy’s, a four-year-old restaurant in Singapore that has consistently received rave reviews both locally and internationally since it opened. Iggy’s has also been consistently ranked among the world’s best restaurants by other media and surveys. To determine the Top 20, The Miele Guide conducted four rigorous rounds of selection and judging. The selection process started with the creation of an initial shortlist of “Asia’s best restaurants” by a panel of 84 of the most respected restaurant critics and food writers from over 16 countries in Asia. Then, over 10 weeks, over 15,000 registered voters, from over 40 countries, cast over 75,000 votes for the restaurants they believe are Asia’s best via an online survey, hosted at www.mieleguide.com. 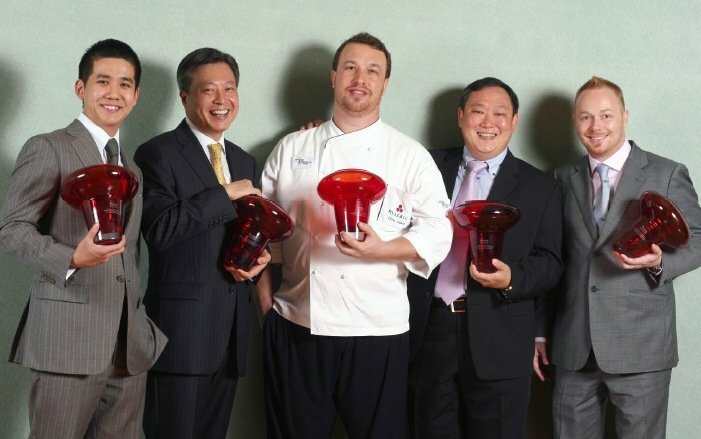 Each voter was allowed 10 votes, only 3 of which could be cast for restaurants in their own country (if they live in one of the 16 countries being evaluated in the 2008/2009 edition). In addition, a group of 1,500 foodies, F&B professionals and journalists were invited to form a special jury and cast votes for their picks, separately from the public. The results of these two votes were combined with slightly more weight given to the public vote. Over 2,000 restaurants received votes in these two rounds. From this, The Miele Guide selected the top 320 ranked restaurants for inclusion in the 2008/2009 edition. To further evaluate and confirm the rankings of Asia’s Top 20, incognito tasting at the top 25 ranked restaurants were conducted by The Miele Guide team, with help from contributors in selected countries. This year, restaurants in 16 Asian countries were evaluated—Brunei, Cambodia, China (including Hong Kong and Macau), India, Indonesia, Japan, Korea, Laos, Malaysia, Myanmar, Philippines, Singapore, Sri Lanka, Taiwan, Thailand and Vietnam. Great that Singapore has 4 restaurants in the top 10. I would also include “Halia” at the Singapore Botanical Gardens and “Le Pont de Vie” at 26 Kandahar Street, Kampong Glam – two of may favorites that never fail to impress.